Thorne & Derrick International, based in the UK, distribute an extensive range of Offshore Cable Joints to suit halogen free (zero halogen), flame retardant, MUD resistant, heat resistant and fire resistant offshore and shipboard power, control and instrumentation cables. Contact T&D to discuss offshore cable jointing and splicing applications in the oil and gas industry – joints are available for NEK606 (RFOU BFOU EPR TCWB) and BS6883/BS7917 (UKOOA) Cables. NEK606 cable joints can be supplied to connect and repair flame retardant, fire, oil and MUD resistant cables. Cable joints are also available for leading manufacturers cables including Nexans AmerCable (Gexol), General Cable, Okonite, Helkama Bica Oy, Nexans and Prysmian. Specialist offshore cable joints are also available to suit Marine and Offshore Cables (IEC 60092) – this includes heat shrink cable joints utilising zero halogen tubings for flame-retardant (IEC 60332-3A) and fire-resistant (IEC 60331) cables. Typical application and installations include FPO, FPSO, Drilling Ship, Topside and FSU – especially where cable joints are required to maintain circuit integrity and continue to work for a specified period of time under defined fire conditions. In accordance with American Bureau of Shipping (ABS), Lloyds Register of Shipping (LR), Canadian Standards Association (CSA), Transport Canada Marine Safety, Det Norske Veritas (DNV), Underwriters Laboratories Inc. (UL), Intertek Testing Services (ETL) and United States Coast Guard (USCG). Thorne & Derrick stock the most complete range of 3M Cable Joints for offshore jointing and repairing of EPR insulated flexible wire braided low voltage power cables. 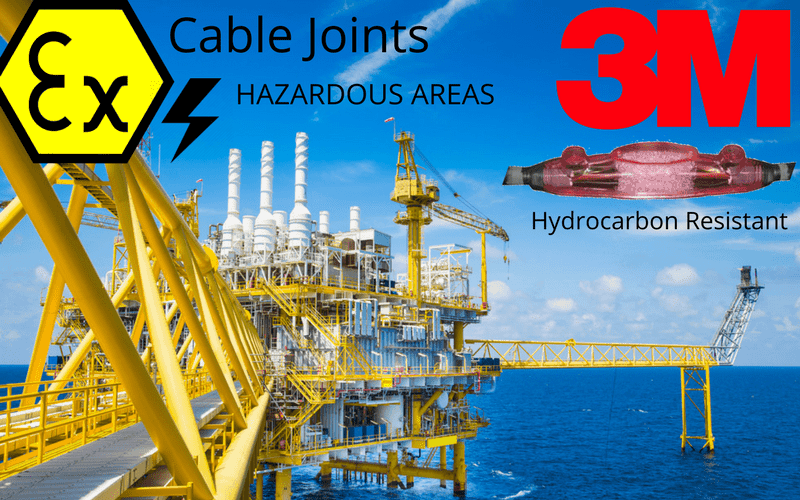 The 3M LVI3 range of Scotchcast Cable Joints utilising 3M 1402FR Resin are extensively specified for the jointing, splicing and repair of offshore cables in the oil and gas industry up to 3.3kV – this includes low voltage power, control and instrumentation cables installed in Zone 1 & Zone 2 hazardous areas designated according to ATEX Directive. For medium/high voltage power cables there is a choice. MV- HV Cold Shrink joints are available with cold shrink outer protection jacket or encapsulated with a cable joint shell and filled with Scotchcast 1402FR resin to provide additional protection against aggressive and corrosive chemicals, oils, gases and MUD. 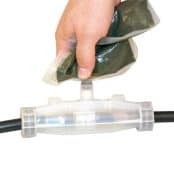 3M LVI3 cable joint kits should be installed in temperatures above freezing point to ensure that the Scotchcast resin is properly mixed and cured (the resin can be warmed by the cable jointer in a vehicle if required). Once installed the cable joints are stable at lower temperatures down to -40°C. Thorne & Derrick have produced custom specification offshore 33kV cable joints to repair and connect submarine power cables for land underground installation – typically the straight joints would be installed on the cable deck of an Offshore Substation (OSS) located on an offshore wind farm. The cable test requirements were in accordance with IEC 60502-4, rated or operating voltage 19kV/33kV and maximum voltage 33kV – briefly the 33kV offshore cable specification would include XLPE insulation, extruded bonded semi conductive compound, water blocking tapes, metallic screen and a single layer of galvanised steel wire armours filled with bitumen. Contact T&D for offshore repair joints in a range of materials for LV MV HV cables including heat shrink, cold shrink or resin cable joints. ♦ View our complete range of Offshore Cables, Cable Accessories (Joints | Glands | Cleats) & Electrical Equipment for use with IEC Cables.